He has also taught at schools and local organizations, including the North Penn Arts Alliance and the Antonelli Institute for Graphic Design & Photography. 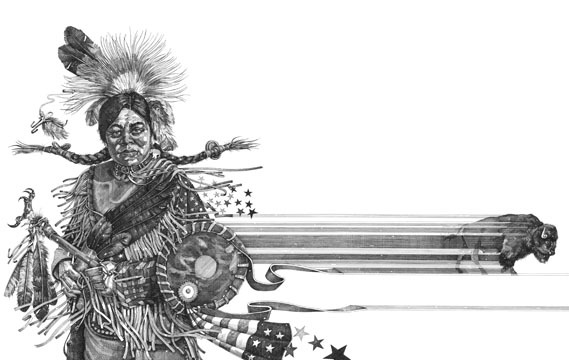 After participating in our Military Veterans Exhibit last summer, Fione is returning with a solo “best-of” show, spanning illustrations from his career, with an emphasis on classic drawing. “If you know what to look for, they also show the influence of other illustrators and artists like Bob Peak’s composition and design, Franklin Booth’s line work and Daniel Green’s pastel painting,” he says. Here, Fione shares some insight into his long and varied career. For the love of it: “I like the challenge of drawing and painting and that is exactly what illustration lets me do. Although creating illustrations means working long hours sometimes without a day off for weeks and under the pressure of deadlines, I can’t say it’s really work. From commercial to fine art: In recent years, Fione’s work has included portrait commissions and a 25-foot mural for the Philadelphia chapter of the American Gold Star Mothers (he also was involved in painting a mural in conjunction with our art center at College Settlement Camp in Horsham last summer). He’s also tasked himself with the ambitious goal of creating three large-scale paintings of the ancient Roman legions. “The Art and Illustration of Dan Fione” opens Aug. 26 with a reception from 5 to 7:30 p.m. in our farmhouse, 305 Horsham Road, Horsham, Pa. The exhibit runs through Sept. 21.